Product prices and availability are accurate as of 2019-04-22 21:08:48 UTC and are subject to change. Any price and availability information displayed on http://www.amazon.com/ at the time of purchase will apply to the purchase of this product. 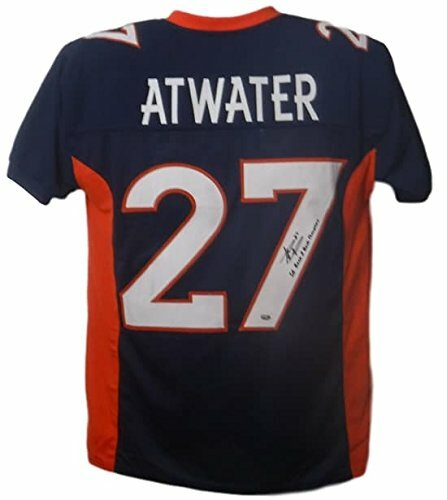 This is a custom size XL blue jersey with sewn on name and numbers that was personally autographed by Steve Atwater with Back 2 Back SB Champs inscription. He is known for being one of the hardest hitting safeties in NFL history that helped the Denver broncos win back to back Super Bowl Championships (XXXII, XXXIII). Steve was an 8x Pro Bowl selection and is in the Denver Broncos Ring of Fame. This item includes a certificate of authenticity from Sports Card Guaranty (SGC) and Denver Autographs.